Alphonse Areola // Villarreal (on loan from PSG) // 22 // Keeper: After having been disappointed at being over-looked at PSG again, as the club signed Kevin Trapp. But as he did with Bastia last season, Areola has grabbed his loan opportunity with open arms. At the weekend he led his side to a memorable victory over Atletico Madrid, putting in save after save as he denied Simeone’s men, in turn leading his side to the top of the Spanish league. Elseid Hysaj // Napoli // 21 // Right-Back: The man who joined Napoli from Empoli in the summer becomes the first Albanian to feature in our Talent Radar Team of the Week. On the weekend he faced arguably his biggest test at his new club, as Napoli hosted defending champions Juventus. But playing in an organized and compact defensive system, the 21-year-old impressed as the home side got a memorable 2-1 victory to pile more pressure on Juventus after their poor start. Making an impressive seven tackles, Hysaj proved to be a solid stoke in Napoli’s defensive wheel. Andreas Christensen // Borussia Monchengladbach (on loan from Chelsea) // 19 // Centre-Back: Following Lucien Favre’s resignation, there was an air of disappointment around the German game. But Monchengladbach have been rejuvenated since the event, winning both their games. A 3-1 win away to Stuttgart was the latest joy, as Andreas Christensen took his place in the centre of the defence. His aerial ability was put to full use with the 6’2” defender winning all his duels. Faced against the likes of fellow German youngster, Timo Werner, Christensen was exceptional in his performance. Eric Bailly // Villarreal // 21 // Centre-Back: The Ivory Coast international started grabbing Talent Radar’s attention last season, but his performance on the weekend was arguably the most impressive thus far. Part of the defensive set-up with the Yellow Submarine, Bailly ensured Areola’s clean-sheet was kept intact. Having to deal with all of Atletico’s attacking options – Jackson Martinez, Antoine Griezmann, Fernando Torres & Luciano Vietto – the 21-year-old displayed immense maturity and confidence to secure a terrific three points for the home side. Lucas Digne // AS Roma (on loan from PSG) // 22 // Left-Back: The French youngster’s last goal came in 2013 whilst still playing in France with Lille. But on the weekend as Roma got a convincing 5-1 victory over Capri, Digne was on hand to score only his fourth senior career goal. Making a run to the back-post, Digne ensured he got his name on an Italian scoresheet in only his second league start. He also helped set-up the opening goal while facing a fairly quite game defensively. Digne is widely regarded as one of the best young left-backs in world football (a vast pool in itself), and seems to finally be getting a fair chance in Rome. Kingsley Coman // Bayern Munich (on loan from Juventus) // 19 // Right Midfield: How often do you come across a 19 year old who has played for three of the biggest clubs in the world at senior level? The Frenchman, who already has a Ligue 1 winner’s medal with PSG is currently on loan at Bayern Munich from last season’s Serie A champions, Juventus. Despite his highly spoken of talent, the loan deal posed a big question mark whether the youngster would get much playing time at the German club but so far, Coman has featured in four out of five competitive games Bayern have played this season, contributing three assists and two goals in the process. This past weekend, Coman started his second full ninety minutes for Bayern against hosts Mainz where the teen was a part of two of the three goals scored that evening. 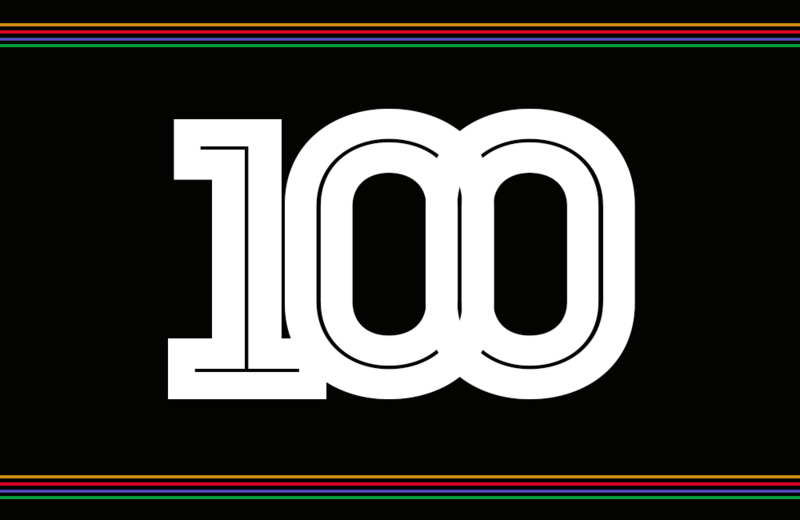 It wouldn’t be much of a surprise if you saw Coman’s name appear a lot more in future Talent Radar articles. Eric Dier // Tottenham Hotspur // 21 // Centre Midfield: Mauricio Pochettino brought in reinforcements for the Spurs back line this past summer which handed Cheltenham born Eric Dier a more flexible role, arguably as a necessity. Dier has started all the matches for the London club this season, stationed as a defensive midfielder. This past Saturday, Spurs were hosts to Manchester City. With Yaya Toure given the role right behind the striker, the Englishman had a task at hand, one which he executed with confidence. For most of the game, the central area right in front of the penalty area was compact with Spurs players where Dier was the central figure. This produced a blockade through the central channel for City to work their way in. The 21 year old managed to get on the score sheet as well with a long range effort; the goal doubling his tally for the season. 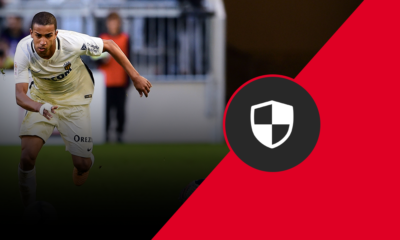 Vincent Koziello // OGC Nice // 19 // Centre Midfield: Vincent Koziello is fairly new to senior level football as well as the Talent Radar scene. Having said that, Koziello has played in all Ligue 1 matches for Nice this season and has started to make his presence known. Nice put 4 goals past Saint Etienne this past weekend on the road and it was the 19 year old who was in the middle of things, having gladly helped himself earn a spot on the score sheet as well as set up one for a team mate to put the game beyond reach. Despite having the fewest touches among the Nice midfielders, Koziello made his touches count, producing key passes as a further contribution to his performance. With the faith placed in him and the recent confidence boost, we hope to see more of the youngster in our Talent Radar circles. Julian Brandt // Bayer Leverkusen // 19 // Left Midfield: Roger Schmidt has interestingly enough chosen Julian Brandt to play in a more central attacking more in their Champions League matches (qualifier included) but it sure seems certain that Brandt, if had a choice, would choose to play on the left and it’s precisely where he has featured in all of his league games for the German club. After being benched last week against Mainz, Brandt returned to the starting XI and had a point to prove in the match against Werder Bremen. The 19 year old returned to scoring ways, grabbing one of three goals that Leverkusen managed to put at the back of the Bremen net. Ayoze Perez // Newcastle United // 22 // Striker: Newcastle had a troublesome campaign last season but one promising aspect found at St. James’ Park was an energetic young prospect in the form of Ayoze Perez. The Spaniard, who had some wonderful moments last season scoring seven goals, was on the bench for the first two games of Steve McClaren’s reign. In the four games that followed, McClaren instructed the twenty two year old to play out wide but this past weekend, Perez was given the role of a second striker. Newcastle were two goals up against Chelsea at one point in the game, much credit given to Perez who scored one and set up the other. We’ve spoken of him last season and we could say the same again: there may be gloomy days for Newcastle but Perez is certainly a joy to watch. Muamer Tankovic // AZ Alkmaar // 20 // Striker: Despite having a natural preference down the left flank, Muamer Tankovic makes his first ever Talent Radar appearance in the form of a striker. The Fulham youth product who transferred to the Dutch side on a free transfer has had quite an uprising season so far, already having seven assists and three goals in all competitions penned next to his name. 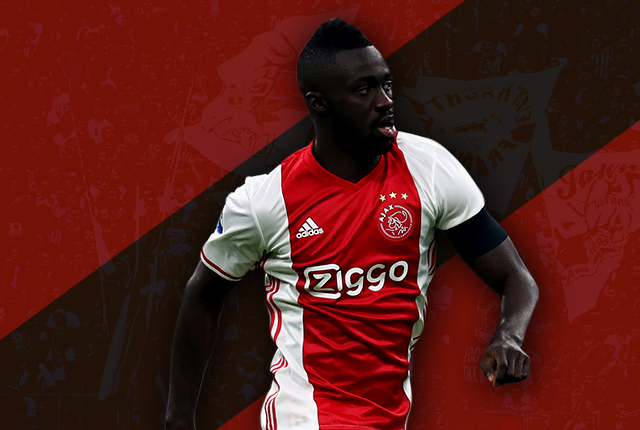 The latest of his contributions was a well balanced performance against Heracles Almelo where he contributed a goal and an assist. 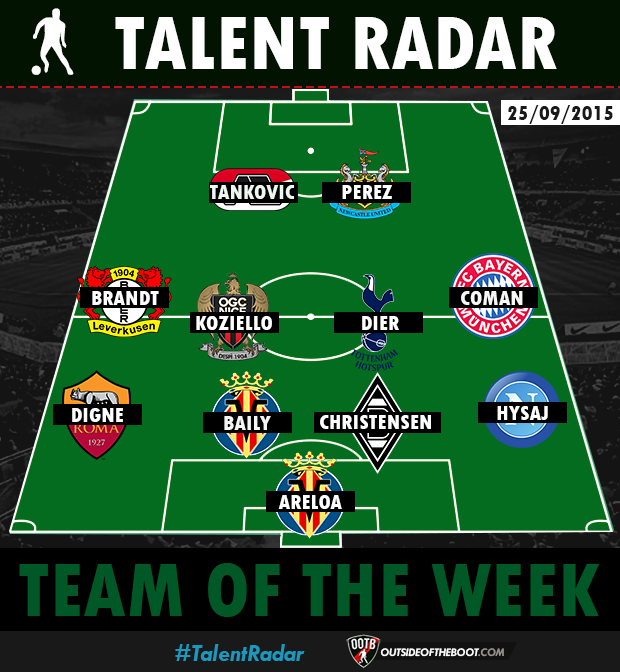 The performance earns Tankovic his first appearance in our Talent Radar Team of the Week, hopefully one of many more.